Almost every magazine in America directs the majority of its content so it’s all about you. We are eating up the whole “me, myself, and I” concept like it’s our last meal. I’m not saying that we should never focus on our own selves, but think about all of the times someone who needed help was right there at your feet. And you were too busy focusing on your own problems to help them. This is a huge wake up call for everyone– myself included. I struggled with depression during my last two years of high school, and even as a new Christian I still struggled to find the joy that all of the other Christians around me seemed to have. I was very wrapped up in my own emotions and pain. Now it’s not a bad thing to feel and experience your pain, but I was letting it overcome me– even though Jesus was shouting for me to just look to Him instead of all the things that were wrong with myself. To be honest, I still struggle with this sometimes. It’s not that I’m some self-centered person; In fact, most of us are actually quite caring. God has instilled in every single one of us the ability to love others, but we first need to experience His love in order to fully utilize this gift. We all go through hardships, and we need to take the time to grieve, cry, and heal from life’s hurdles. However, we can’t let ourselves get so wrapped up in them that we can’t even see beyond ourselves and the problems we are facing. That’s not healthy for anyone. Despite our pain, we must always reach out to others and be a source of love and comfort (something I learned from my Mama!). Think about how horrible Jesus must have felt. He was mocked, threatened, persecuted, betrayed, beaten, humiliated, and then left to die on a cross (even though He did nothing wrong). Almost everyone else would’ve been super depressed to the point that they couldn’t even think of anyone else. It’s not that Jesus wasn’t upset or scared about all of this– “And he went a little farther, and fell on his face, and prayed, saying, O my Father, if it be possible, let this cup pass from me: nevertheless not as I will, but as thou wilt” (Matthew 26: 39 KJV)– but instead of dwelling on His torture and horrible death sentence, you know what He did? Jesus prayed for you. Yup, that’s right. “‘My prayer is not for them alone [His disciples]. I pray also for those who will believe in me through their message, that all of them may be one, Father, just as you are in me and I am in you. May they also be in us so that the world may believe that you have sent me'” (John 17:20-21 NIV). Your Lord and Savior loved you so much, He still thought of you until the end. Now obviously none of us are perfect like Christ (which is exactly why we need Him), and even He felt sadness sometimes. The point of this message is that there’s healing and fulfillment in serving others. So how do we go about this? 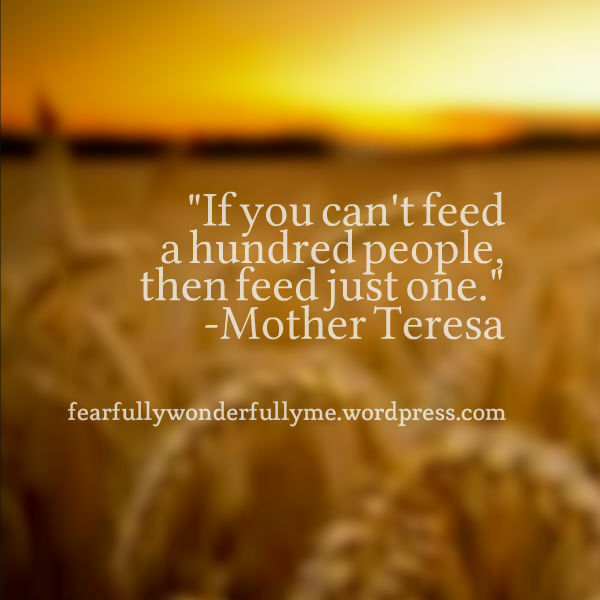 Do we swear off ourselves and spend the rest of our lives feeding the homeless? Well, no–unless God has really called you to do that. The first thing we need to do is deepen our relationship with God. We need to put Him first and come to Him with all of our troubles and pain. Trust me, He wants to hear from you– “Casting all your care upon him; for he careth for you” (1 Peter 5:7 KJV). We also need to realize that thinking about others before ourselves is actually quite simple. Ask God to show you how you can be a blessing to others. Maybe you could get some groceries for your mother, or maybe sit down and call a friend who you haven’t spoken to in a while. It could even be as simple as praying thoughtful prayers for those you know are going through a difficult time. All of these ideas can make a greater impact than most of us even realize. Serving others gives us a break from our own stress, and gives us the chance to help heal others. 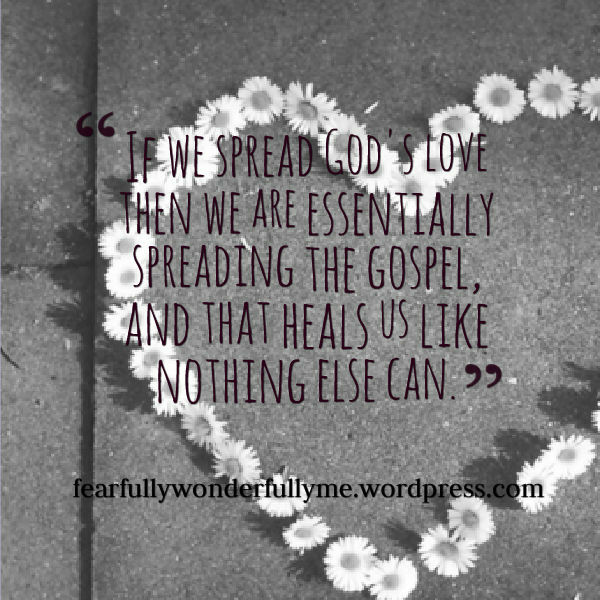 If we spread God’s love then we are essentially spreading the gospel, and that heals us like nothing else can.